All: Almighty and eternal Father, accept our prayer of thanksgiving for your Beloved Son, our Savior and Lord. 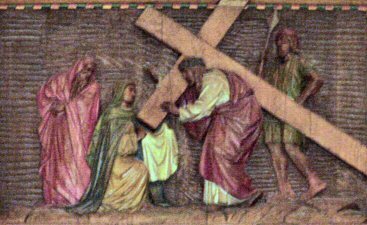 As we recall his Sacred Passion send the Spirit of Christ into our hearts, we beg You, so that whether we pray or work we might do all in union with Christ our Redeemer. Amen. Hymn: Jesus, Lord, condemned, defiled, may we too be meek and mild as we tread your holy Way. May we feel no bitter hatred, when we too are persecuted, left alone to walk with You. Leader: Let us pray. All-powerful and eternal God, for proclaiming the truth you Son, Jesus Christ, is condemned to death by crucifixion. Stir up your love in our hearts so that we might be ever faithful to all that You have told us and fear nothing more than the loss of your friendship through sin. Hymn: Now the Cross as Jesus bore it, has become for us who share it, the jeweled Cross of Victory. 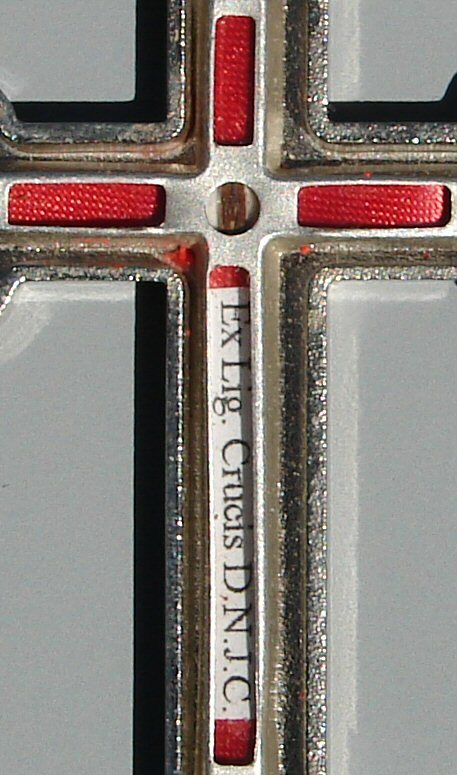 Leader: We adore You, O Christ and we praise You. Leader: Let us pray. 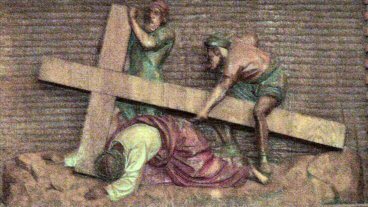 Father in heaven, your Son, Jesus Christ, still carries his Cross in his persecuted brothers and sisters throughout the world. Make us feel the needs of all persons so that we might as readily help them as we would help Jesus himself. Hymn: Weakened, prodded, cursed, and fallen, His whole Body bruised and swollen, Jesus tripped and lay in pain. 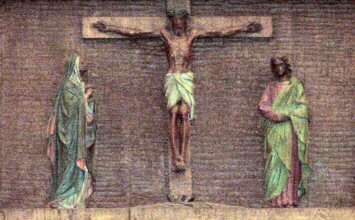 Leader: Let us pray, O God, to free us from sin and weakness your Son, Jesus Christ, embraced his fearful passion and crucifixion. 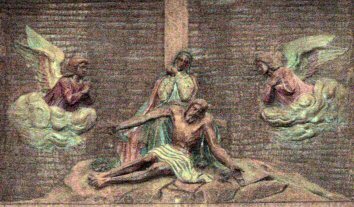 Strengthen us in our baptismal resolutions by which we renounced sin and Satan, so that through the passion of this life's sufferings we might rise to a new life of joyful service free of all selfishness. Hymn: Jesus met his grieving Mother, she who made the Lord our Brother; now the sword her heart has pierced. Leader: Let us pray. 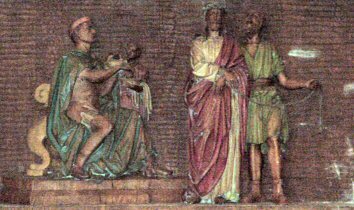 O blessed Lord, at your passion a sword of sorrow pierced the loving heart of your mother as Simeon had foretold. Grant that we who look back on her sorrows with compassion might receive the healing fruits of your sufferings. 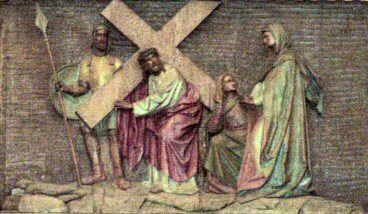 Hymn: Simon stopped in hesitation, not foreseeing his proud station, called to bear the Cross of Christ. Leader: Let us pray. 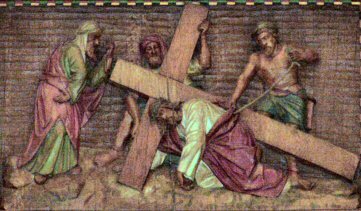 Lord Jesus Christ, help us to see in the sufferings and shortcomings of our lives a share in Your Cross; strengthen and console us in the belief that we bear all things in union with You, who have taken upon Yourself even our guilt. Hymn: Brave but trembling came the woman, none but she would flaunt the Roman, moved by love beyond her fear. Leader: Let us pray. Almighty and ever-loving God, we feel your love and understanding in the consolation and support we receive from one another. Give us, we beg You, the courage and dedication to sacrifice and suffer with those who are in need, the least of your people. 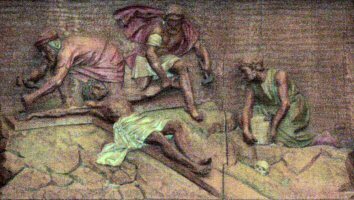 Hymn: Prostrate on the dust He crumbled, flogged in Body He resembled all our brothers poor and scorned. Leader: Let us pray. Lord Jesus Christ, You shared in our weaknesses and accepted our guilt. Grant us the favor of rejoicing over our human weaknesses, so that in all we do, Your strength, dwelling is us, may be shown to all others. 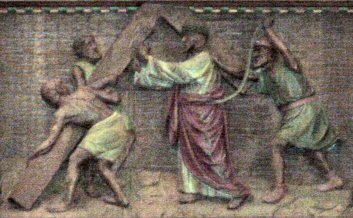 Hymn: May our sympathy for Jesus turn to those who here now need us, may we see Christ bruised in them. Leader: Let us pray. 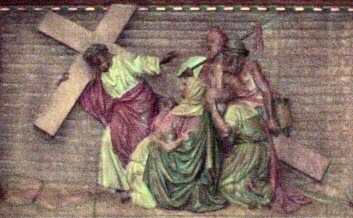 Beloved Jesus, with tears of pity these women of Jerusalem responded to You, broken, bruised, and beaten, on the road to Calvary. Deepen our faith, we beg You, so that we may see You in our brothers and sisters, bruised by our envy, beaten down by injustice, and broken by our greed and our indifference. Hymn: Jesus fell again in weakness, stumbling as we do, to lead us through our sorrow and our pain. Leader: Let us pray. 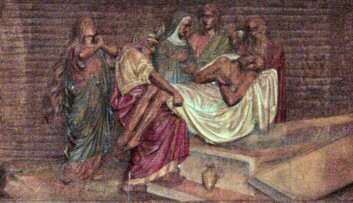 Almighty and eternal God, you permitted your Son to be weakened, crushed, and profaned so that He might rise from the dead freed from the ravages of sin. Help us to accept our weaknesses and failings as forerunners of our glorious resurrection in union with your Son. Hymn: Stripped and jeered by his own nation, Jesus stood in desolation, giving all He had to give. Leader: Let us pray. 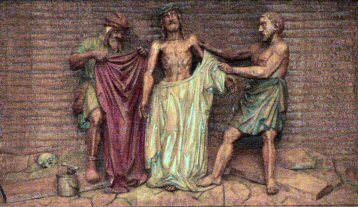 Lord Jesus Christ, stripped of everything. You stood exposed to the jeers and contempt of the people whom You loved. Clothe us with genuine love of others, so that nothing we suffer may ever fill our hearts with hatred or bitterness. Hymn: Pierced the hands that blessed and cured us, pierced the feet that walked to free us, walked the hill of Calvary. Leader: Let us pray. Lord and Savior, You have told us that we too must accept crucifixion if we are to accept resurrection with You. 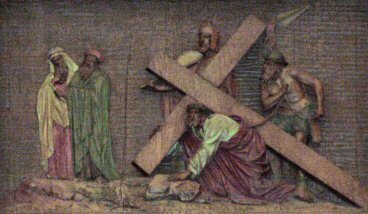 Help us to rejoice in the sufferings that come with the fulfillment of our daily duties, seeing in them the royal road of the cross to the resurrection. Hymn: Life eternal, death defiant, bowed his head - the world was silent, through his death came life anew. All: My people, what have I done to you? or in what have I offended you? Answer me. What more should I have done, and did not do? 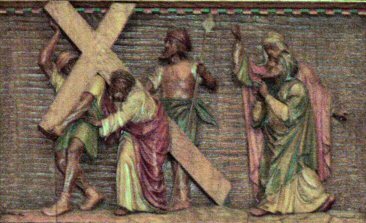 I led you out of the land of Egypt, and you prepared a cross for me. I opened the Red Sea before you, and you opened my side with a lance. 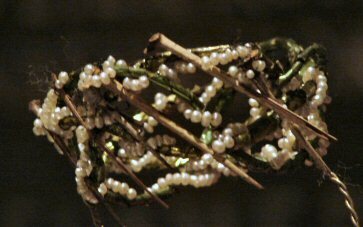 I gave you a royal scepter, and you have given me a crown of thorns. With great power I lifted you up, and you have hung me upon a cross. My people, what have I done to you, or in what have I offended you? Answer me. Hymn: Stunned and stricken, Mary, Mother in your arms was placed our Brother, "Full of grace" now filled with grief. Leader: Let us pray. Beloved Savior, You returned to the Father all that He had given You, so that He might restore all to You a hundred-fold in the glorious resurrection. Help us, we beg You, to give generously of ourselves in all that we do for You, so that like You we might be made perfect in a new resurrection. Hymn: Jesus, Lord, your gift accepted, in three days You resurrected, You did first what we shall do. Leader: Let us pray. Almighty and eternal God, on the edge of sadness when all seemed lost, You restored to us the Savior we thought defeated and conquered. Help us, we beg You, so to empty ourselves of self concern that we might see your hand in every failure and you victory in every defeat. These things we ask in the name of your Son, Jesus Christ, who lives and reigns forever with You in the unity of the Holy Spirit. Hymn: Jesus, risen, be our lover in your Food and in our brother. Lead us home to heaven with You.